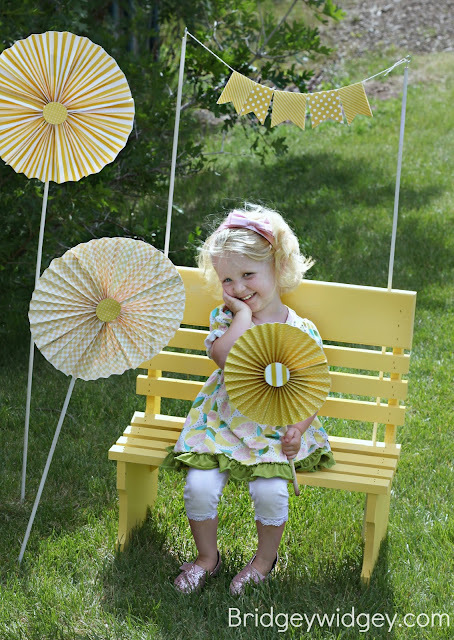 Hey everyone, I am so excited to be guest posting over at What Dee Dee Wants. 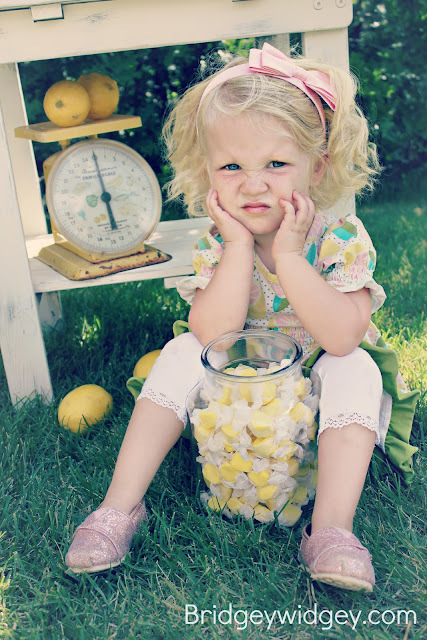 My name is Bridget and I am a event stylist and blogger behind Bridgey Widgey. 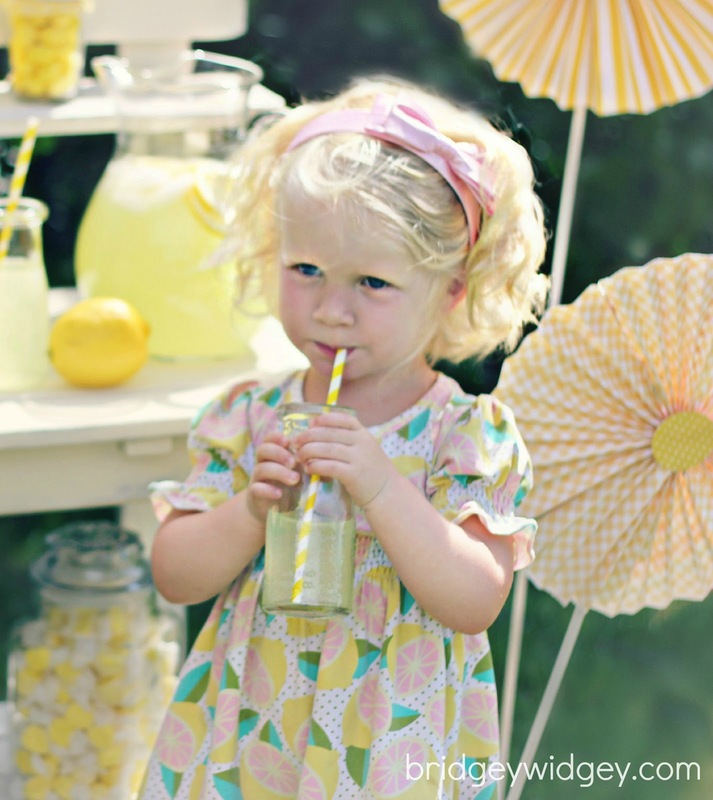 I don't know what it is about a paper straws and pendant flags that gets me all excited, but hey, I guess I am easy to please :) On my blog, I talk about fashion, my life, crafts, and I have lots of tutorials on how to recreate my parties. 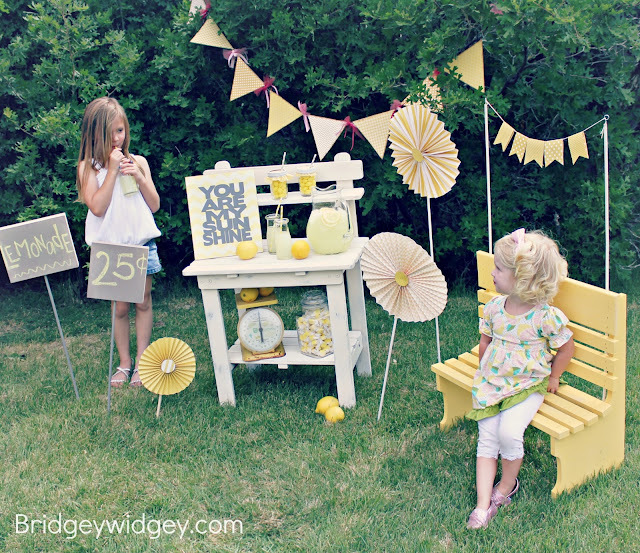 Today I am going to share with you a tutorial on a cute photo booth station that I used for a lemonade stand. You know if you saw this stand driving by you would have to stop. 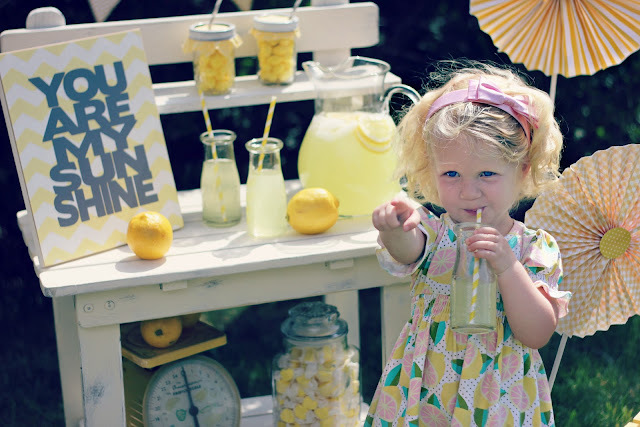 Your kids will be so excited when they have a line at their next lemonade station :) Also it can double for photo booth. Now this is what I am talking about! I love two for ones.I also love photo booths at parties, there is something about a photo booth that brings out the best in people. I love to see the candied photos of people that may otherwise be shy. 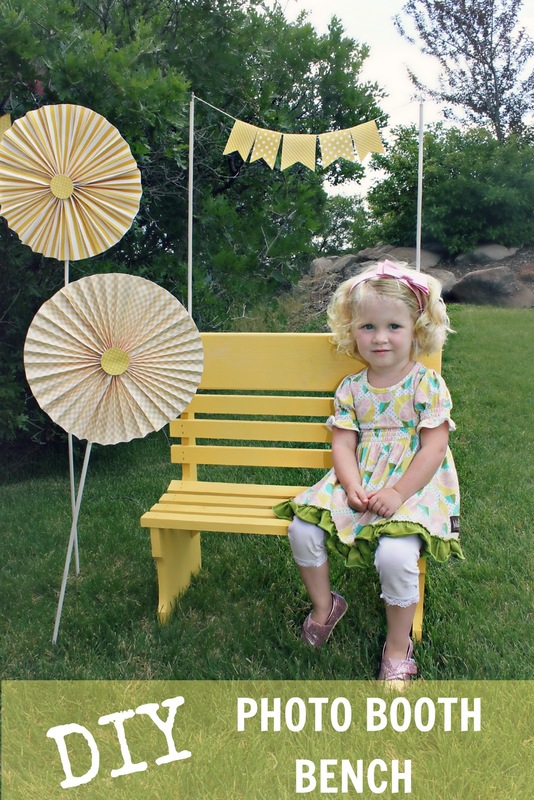 Now in order to get some fun shots, you can't just have a camera and people, you need a cute set up! 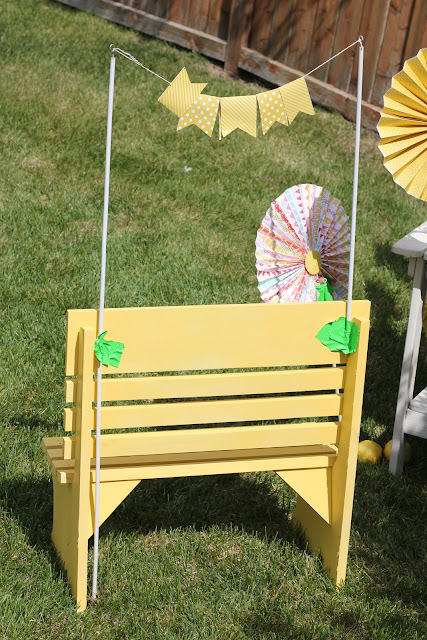 Step1, 2, and 3: Get your bench, prime, and then paint it. Easy enough right? 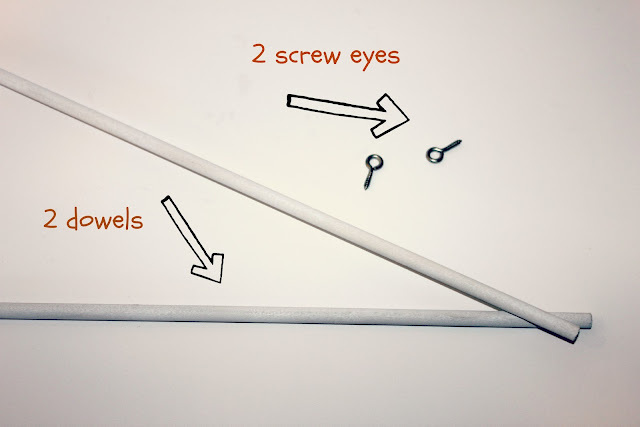 Step 4: Screw in the screw eyes into your dowel and tie your bakers twin through each loop to create the banner. Step 5: Duct tape your dowels to the back of the bench. I didn't nail gun it in because I wanted to keep my options endless, and be able to change it up for another party. Neon green duct tape... I am high class huh? Also don't mind my dowels are different. Last minute I decided to add the paper medallions and I needed the height of the original dowel that was suppose to be behind the bench. This bench is darling! I will have to make one for my daughter's next birthday party. This is so adorable. Our grandson will be turning 3 this next month and I think I will use this idea with a boyish spin to it. Thanks for the great idea!! Glad to know that there are several people are creative in creating DIY photo booth and have fun of using it.